These last 4 weeks I committed to a daily creative practice – which I’m pleased to say I’ve honoured pretty well. 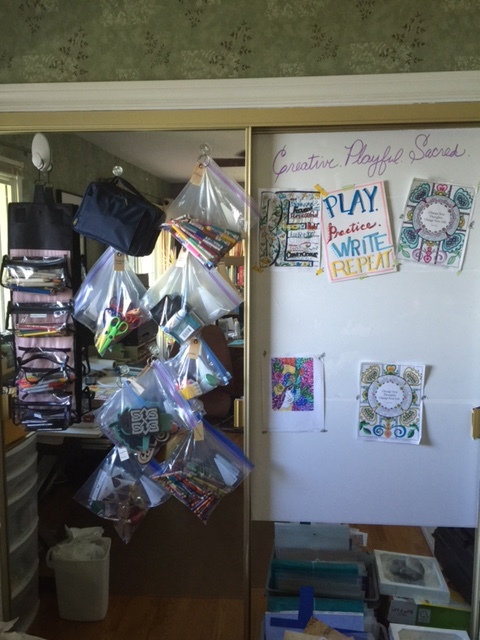 Along the way I learned how important it is to have a place for my art supplies. When I have to hunt for them, it annoys the muse and she doesn’t hang around very long, impatient minx that she is. So in order to support that daily practice pledge I needed to get the foundation in place. First, I narrowed down what I wanted to do. I had supplies for encaustic, oil painting, plaster casting, pottery, knitting, quilting, scrapbooking, watercolours, etc, etc. ad nauseum. While I love mucking about with any creative activity, I finally admitted to myself I simply did not have enough time to do it all. Like my physical space, the time space is also limited. 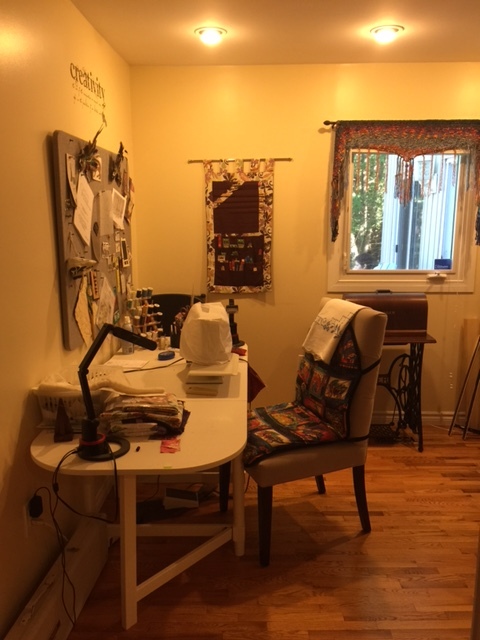 I decided my 30 day focus would be writing, sketching and art journaling, knitting and quilting. Still a lot of ground to cover but at least I don’t feel overwhelmed by too much choice. In fact, as I set up my creative spots in the house, I got rid of the extraneous supplies. It created physical AND mental space. And by limiting my choices, it’s easier to sit down and actually work on something . An unexpected benefit to limited options is that it enhanced the creative flow. I used to joke that I didn’t need more time, I needed more deadlines. Now I realise how true that really is. With limits, I have to think more creatively. I look a lot closer at what I already have before I run out to get the latest gizmo or gadget. . I break my projects down into smaller actions and set goals that can be accomplished in the time I have. Coming up with new ideas and solutions adds to the creative fun! 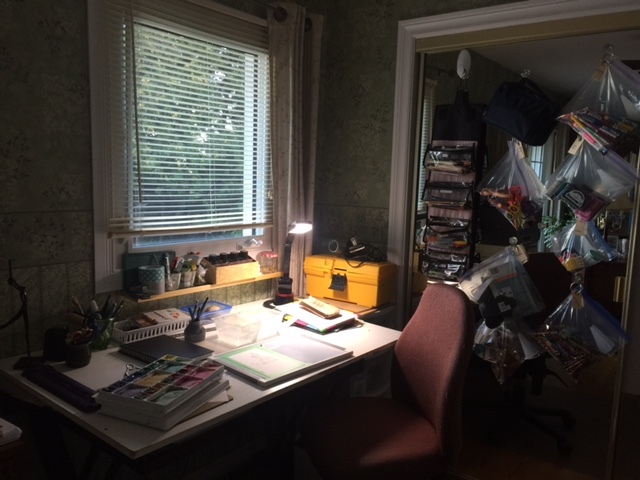 Physically, rather than one big, all encompassing studio space I set up separate, designated spaces. Again, this has helped me tremendously with actually getting to work! 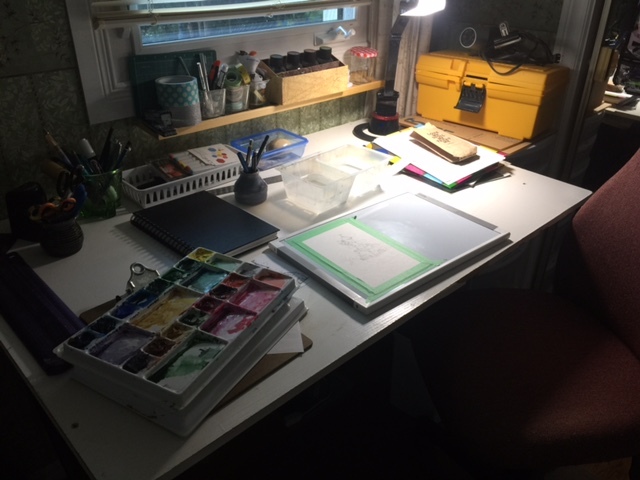 In my office, I put together a spot for sketching and journaling. I like to have my tools out where I can see them to inspire me (and so I don’t forget I have them.) There were big mirrored closet doors in this former bedroom so I stuck suction cup hooks to the glass on one side and hung supplies out in the open. On the other side I added white board contact paper. This is a win-win, because all that mirror creeped me out a little. 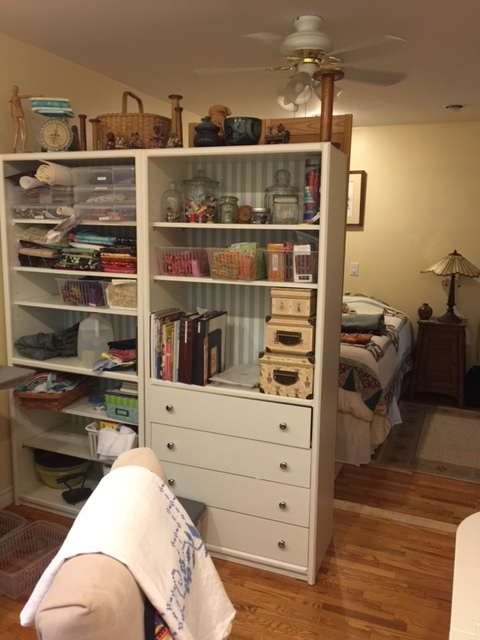 What supplies didn’t get hung up went into labelled drawers, sorted by types such as glues,stamps, paints, etc. 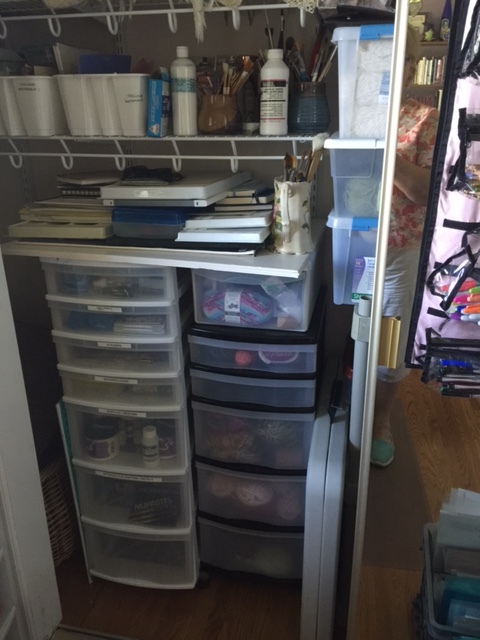 Behind those mirrored doors is my knitting stash in bins and drawers and a few more art supplies. 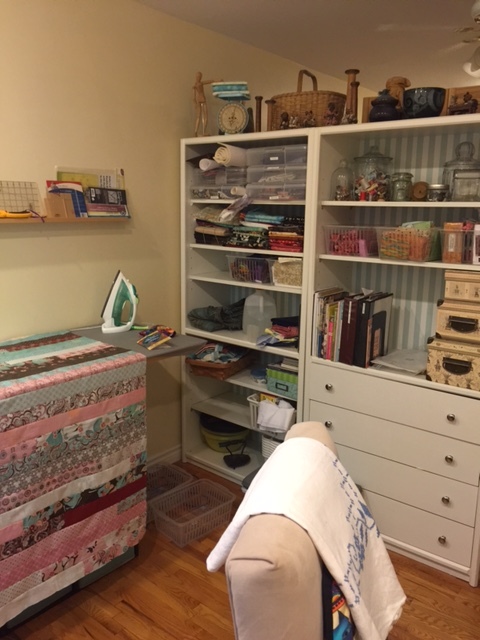 Across the hall, I took over half of our seldom used guest room for my quilting. It’s a long narrow room so my wonderful husband repainted some old shelving units. After I backed them with a cheerful blue striped wallpaper, we turned them sideways to act as a room divider and storage. What I’ve learned from all this editing, tossing and organizing is that you can find space to honour your creative urge anywhere. If you’re feeling stuck because you don’t know where to start, start by sharpening your focus. Maybe you have too many choices and it’s time to edit your options so you can apply your imagination to space and time. It was a great way to use a long room. Hope it inspires your space. Post a pic when you get it set up!